When it premiered off-Broadway in 1972 Grease already reeked of nostalgia for the teen culture of 1950s America, when greased-up hair and inhaling your first cigarette were acts of rebellion. Several generations later, after the sanitised film adaptation and numerous UK stage revivals, Rydell High’s class of ’58 and the fairy tale of schoolgirl Sandy discovering that cool Danny Zuko is the one that she wants seem to have reached post-nostalgia status, especially for anyone who never experienced bobby socks or blue suede shoes. Or at least that’s how this new 27-date touring production feels from the get-go. Unlike Nikolai Foster’s recent revival at the Curve, Leicester, which referenced the grittier original, this version is old school retro in every sense. More or less a pre-packaged reprise of David Gilmore’s 1993 production, it even features Darren Day as a cheesy Teen Angel two decades after playing Danny in the West End, while the all-white casting looks quaintly old-fashioned too. Arlene Phillips revisits her own super-charged musical staging, lending manic energy to classic songs, swirling party skirts and coiffured quiffs. Similarly, the acting is pitched at just-bearable cartoon level, which tends to skip over the true-romance narrative, leaving contemporary pop star Tom Parker, making his stage debut as Danny, struggling to keep up. 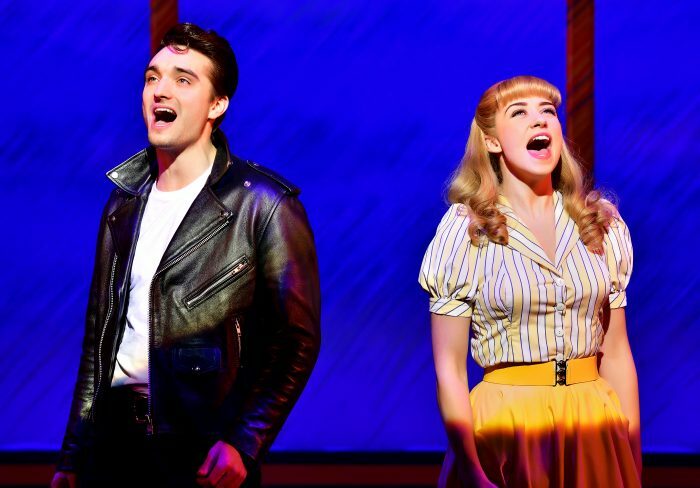 It’s hard to imagine why Danielle Hope’s love-lorn Sandy is hopelessly devoted, while the show’s final message about girls pleasing boys by tarting themselves up makes the 1950s seem light years away. Still, at least the neon-lit nostalgia connects.